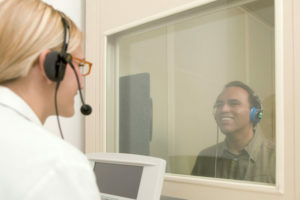 Speech testing is used to measure your speech reception threshold (SRT), or the faintest speech you can understand 50 percent of the time. This is compared with your pure-tone test results to confirm the diagnosis. In addition, your ability to separate speech from background noise will be recorded. Tympanometry is a test of the middle ear used to detect wax buildup, fluid, eardrum perforations, diseases involving calcification of the ear and tumors. It measures movement of the eardrum in response to air pressure; the results are recorded on a chart called a tympanogram. Muscle contraction in the ear is nature’s way of protecting you from loud sounds, the acoustic reflex test measures these involuntary muscle contractions of the middle ear, and is used to determine the location of your hearing problem (the ossicles, cochlea, auditory nerve, etc.) as well as the type of hearing loss. Auditory brainstem response testing is used to determine if there is neural involvement in the loss or if the hearing loss extends beyond the ear to the auditory pathways in the brain. In an ABR test, electrodes are attached to your head, scalp or earlobes, and you are given earphones to wear. Your brainwave activity is measured in response to sounds of varying intensities. Otoacoustic emissions (OAEs) are sounds generated by vibrations of the hair cells in the cochlea of the inner ear. OAE testing utilizes a tiny probe fitted with a microphone and speaker that is used to stimulate the cochlea and measure its response. Abnormal responses confirm the hearing loss is coming from the inner ear. OAE testing is often included in newborn hearing screening programs.